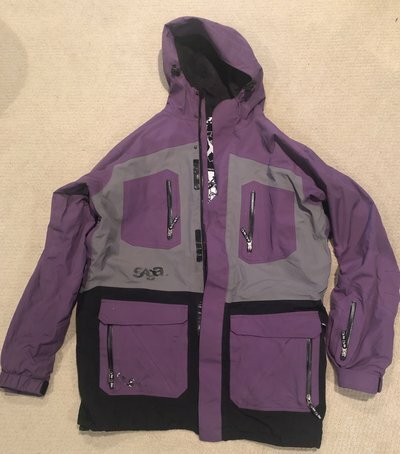 Looking for a little advice on the sizing for the Saga Anomie jacket. Got one a several years ago, loved it, looking to get another. I got an XL the first time around but am looking to downsize to L, but I can't find any info on how long the jacket is and I don't know if they've changed their sizing on the Anomie at all. Any 5'10" guys here wear a L? Any idea what the zipper length on those bad boys are nowadays? I don't believe it changed at all. I thought they had zipper length on their website..? They did last year. I'm 5'11" and I wouldn't buy a medium if I were you. I'd go large for a more standard fit or XL for a baggier fit. teamSESH I don't believe it changed at all. I thought they had zipper length on their website..? They did last year. I'm 5'11" and I wouldn't buy a medium if I were you. I'd go large for a more standard fit or XL for a baggier fit. I can’t find zipper length measurements on their website anymore. Kinda bummed since that was a super useful measurement. This is the XL anomie I have from I’m not sure what year. It’s always been too long for me and way too boxy. I’m not sure what year it is. Zipper length is 38”. no idea what the L anomie length is this year. It’s anorak style so I guess zipper length doesn’t make much sense but I’d still like to know how long it is from collar to bottom. @Saga help a guy buy your gear, pls. Call saga up. I'm sure somebody can help.